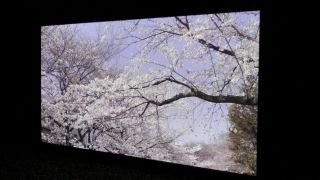 Panasonic's latest 145 inch 8K PDP Super Hi Vision television was on display at IFA 2012, and it's fair to say that the image quality will blow your mind. With Ultra HD (4K) yet to become a familiar site in the living room, the ultra high definition tech remains a fantasy product for most at the moment, but its potential is clear to see. The plasma display, created in conjunction with broadcaster NHK, shows off the next generation of next-gen of televisions, with a massive 145-inch screen allowing for a jaw-dropping experience. The detail is such that a showcase of prowling tigers and tree blossom had even hardened journalists stopping for far longer than necessary to soak up the visuals. The definition of the images means that focusing on detail is inevitable, with an almost IMAX-like experience allowing the majority of the screen to become peripheral. The BBC has recently been showing off its ultra high definition visuals from the Olympics in London, and it's becoming clear that HD is quickly becoming old hat. With the lovely looking 4K panels arriving thick and fast and this 8K television sticking its luscious visuals just over the horizon, the future certainly looks bright for even better definition televisions. NHK says that it intends to start Super Hi Vision broadcasts in 2020, so just around eight years to wait to see what kind of price we should be paying for this kind of TV. We bet it won't be small.